The long awaited fourth volume of our sheepdog training tutorial DVDs, covering further training of Max (the gripper) and a wide variety of training challenges. This is the fourth volume in our series of 2xDVD compilations of sheepdog training tutorials from the online tutorial programme on the Working Sheepdog Website. 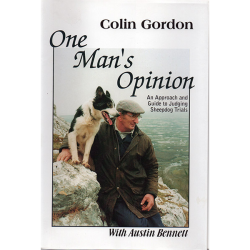 It covers a variety of training challenges, such as slowing down a fast working dog, building enough trust in your dog to enable it to work when you’re not watching it, getting a dog which is determined it’s not going to ride in a vehicle, to jump in willingly, and three further valuable chapters showing the progress of Bronwen and Scylla. 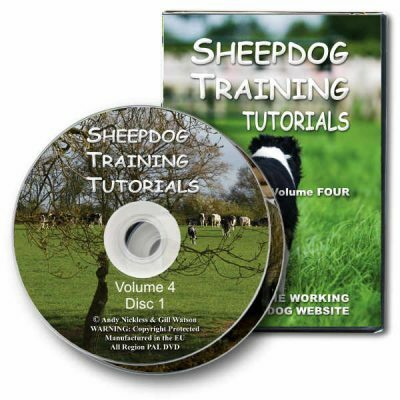 Disc one has eight chapters covering sheep control, an in-depth look at the training ring and how you can get the most out of it, how to get a dog to willingly do something it really didn’t want to do, and three chapters of full training sessions from two very different dogs. How Can I Slow the Dog Down? – Most young dogs work fast, but why do they do it, and how can we slow them down? The Training Ring 1 & 2 – Two chapters which will help you build a suitable training ring, and get more out of it than you may have expected. Back to Forwards – Walking backwards is an important training exercise, but to progress with the dogs training you should revert to walking forwards. But how can you trust the dog to work sensibly when you’re looking the other way? 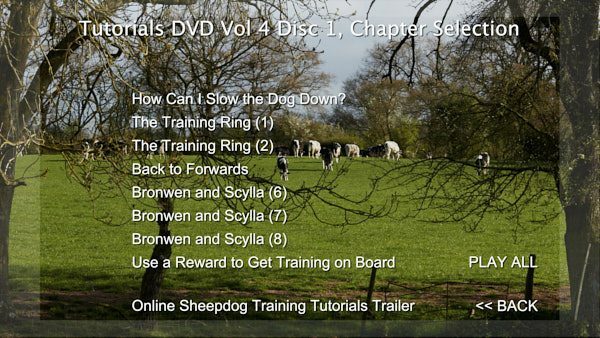 Bronwen & Scylla 6, 7 & 8 – Three more complete training sessions from Bronwen and her litter-sister, Scylla, showing some unexpected problems and how to fix them. Use a Reward to get Training on Board – Young Odo really doesn’t want to ride in a vehicle, but it takes just a few minutes to change his mind. Why Your Dog Should Flank Both Ways – If your dog will only flank one way, sooner or later it’ll become a real problem. Starting a Reluctant Dog – Maisie doesn’t fancy working sheep at first, but with encouragement, she changes her mind. Starting a Non-Starter 1 & 2 – It’s very frustrating to find that your dog doesn’t want to work stock, but with patience (and a few crafty tips) you can usually do it. Top Tips for Training Your Dog – Training a dog to work stock cannot be described as easy, but if you go about it the right way it can be a big help. Training Max the Gripper (2 & 3) – After a horrible start in part one, and despite being very strong-willed, Max continues to make progress and becomes a good sheep and cattle dog. Stop 2 (the perfect stop) – Of course, you must be able to stop your dog, but if you don’t know what you’re doing, you can ruin it’s confidence.